Citation Information: J Clin Invest. 2007;117(12):3900-3908. https://doi.org/10.1172/JCI33372. HDLs protect against the development of atherosclerosis, but the underlying mechanisms are poorly understood. HDL and its apolipoproteins can promote cholesterol efflux from macrophage foam cells via the ATP-binding cassette transporters ABCA1 and ABCG1. Experiments addressing the individual roles of ABCA1 and ABCG1 in the development of atherosclerosis have produced mixed results, perhaps because of compensatory upregulation in the individual KO models. To clarify the role of transporter-mediated sterol efflux in this disease process, we transplanted BM from Abca1–/–Abcg1–/– mice into LDL receptor–deficient mice and administered a high-cholesterol diet. Compared with control and single-KO BM recipients, Abca1–/–Abcg1–/– BM recipients showed accelerated atherosclerosis and extensive infiltration of the myocardium and spleen with macrophage foam cells. In experiments with isolated macrophages, combined ABCA1 and ABCG1 deficiency resulted in impaired cholesterol efflux to HDL or apoA-1, profoundly decreased apoE secretion, and increased secretion of inflammatory cytokines and chemokines. In addition, these cells showed increased apoptosis when challenged with free cholesterol or oxidized LDL loading. These results suggest that the combined effects of ABCA1 and ABCG1 in mediating macrophage sterol efflux are central to the antiatherogenic properties of HDL. Foam cell infiltration of the myocardium in Abca1–/–Abcg1–/– BM recipients but not WT or single-KO recipients. (A) Representative hearts obtained from Ldlr+/– mice transplanted with BM derived from WT, Abcg1–/–, Abca1–/–, or Abca1–/–Abcg1–/– mice and fed a high-cholesterol diet for 12 weeks. Hearts from all Abca1–/–Abcg1–/– recipients were visibly smaller and pale compared with WT and single-KO controls. Scale bar: 1 cm. (B–G) Paraffin-embedded serial sections obtained from the myocardium surrounding the proximal aorta, lung, and spleen of mice transplanted with BM of all 4 genotypes. Original magnification, ×200. 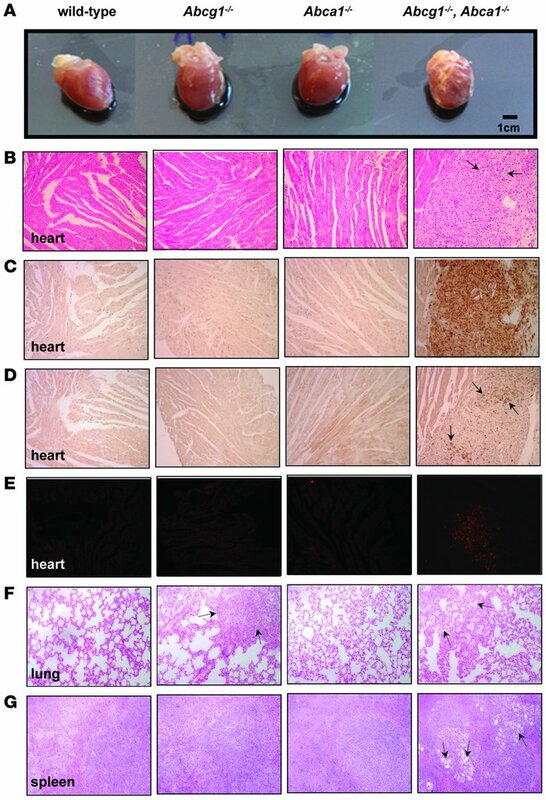 (B) H&E staining revealed an extensive cellular infiltrate in the myocardium of Abca1–/–Abcg1–/– recipients (9 of 9) but not controls (WT, 0 of 12; Abcg1–/–, 0 of 8; Abca1–/–, 0 of 16). The infiltrate resembled foam cell lesions of the vessel wall, including apparent cholesterol clefts (arrows). (C) Mac-3 immunostaining (dark brown) confirmed that the majority of cells were macrophages. (D) MCA771G immunostaining (dark brown) revealed a moderate number of neutrophils (arrows) as well. (E) TUNEL staining revealed pockets of apoptotic cells (red) in the infiltrated regions of myocardium from Abca1–/–Abcg1–/– recipients (7 of 9) only. (F and G) H&E staining revealed an extensive cellular infiltrate in the lungs and spleens of Abca1–/–Abcg1–/–recipients as well as in the lungs of Abcg1–/– recipients. Arrows indicate foam cells.